This post is sponsored by HomeRight. All opinions are my own. We recently remodeled our master bathroom. 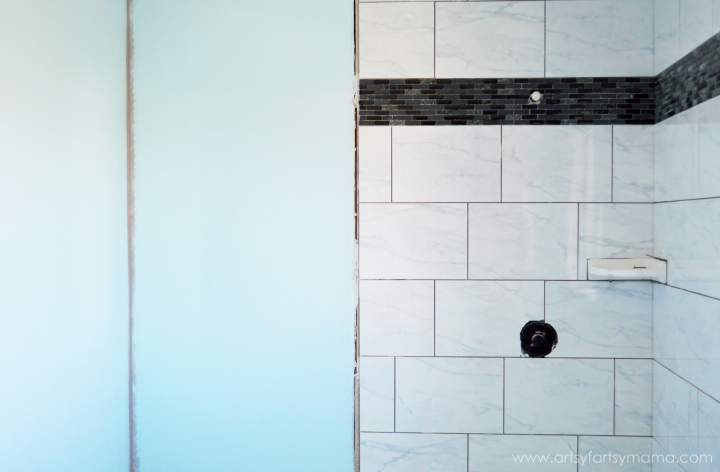 Besides choosing the tile, my favorite part of the renovation was painting. It was a tough choice choosing a color, but we finally decided on Behr's Silent Breeze. Painting can be a lot of work, but with the right tools, you can have the job done in no time. 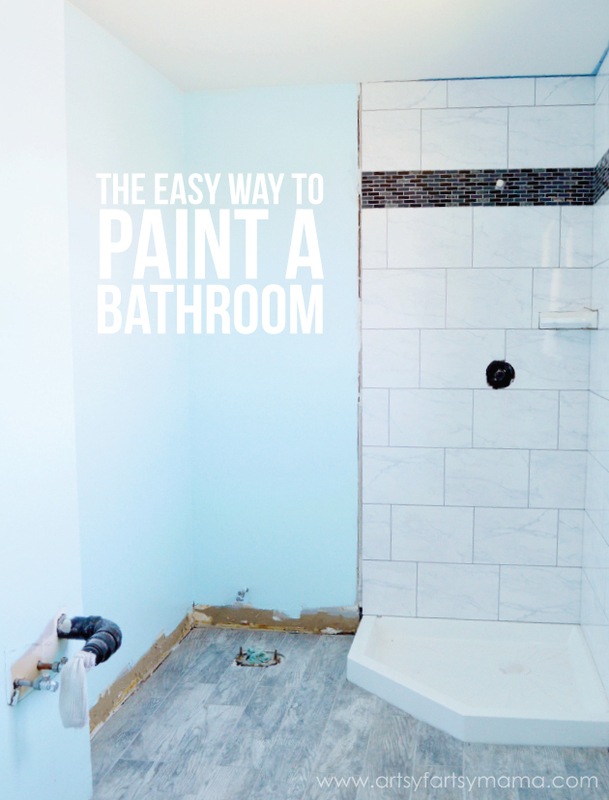 Today I'm going to share some tips to help you paint your next project the easy way. 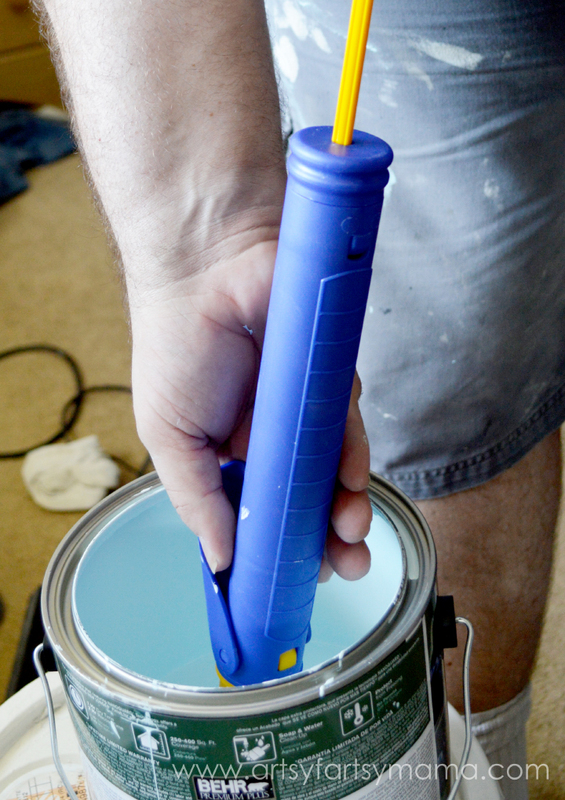 The HomeRight® PaintStick EZ-Twist Paint Applicator is one of the coolest painting tools I've used. 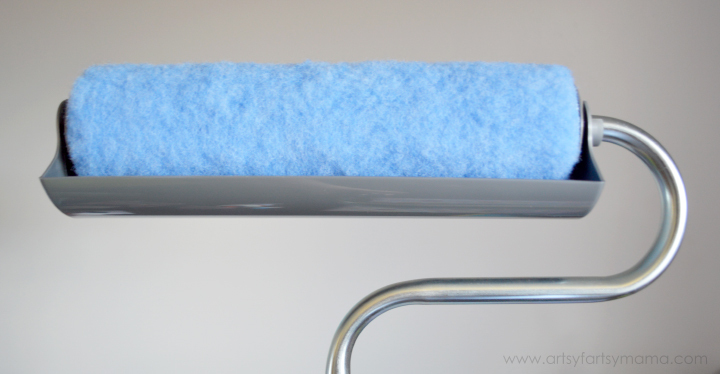 Save time and paint your walls in a third of the time without the mess that comes with traditional trays and rollers. 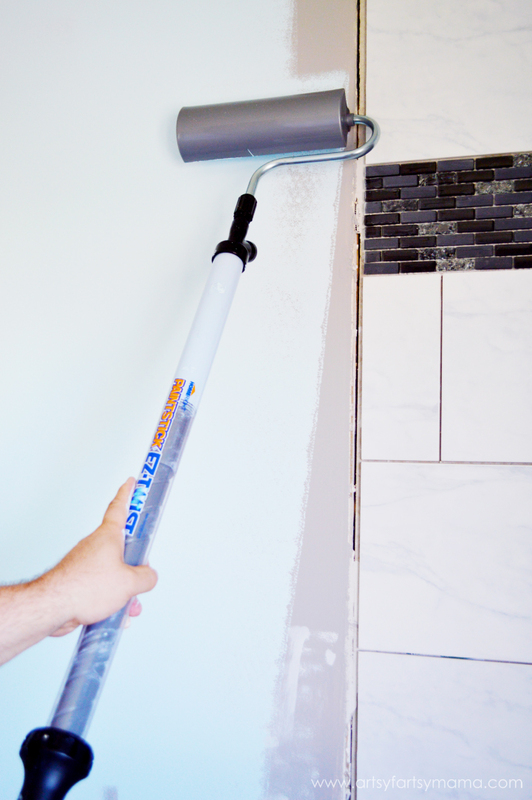 The paint is held in the handle of the roller with an EZ-Twist feature to easily control the paint flow. This really makes painting incredibly easy and quick! First things first - paint. For a bathroom, I would recommend using a paint with a semi-gloss finish because of all the moisture and it's a space that is usually cleaned more frequently than other rooms. As far as supplies go, you can save money by just using the PaintStick EZ-Twist Paint Roller and your gallon of paint. 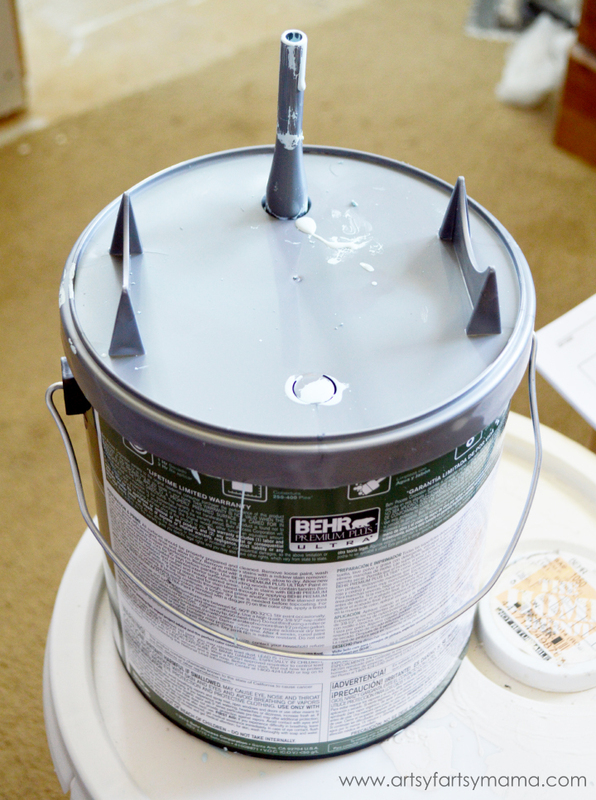 With the roller comes a lid with a fill tube to fit right over the paint can. The fill tube fits into the paint roller handle to pull the paint in, so you don't have to pour or bend over to get paint onto the roller. Once you're done painting, the lid is washable so you can use it again and again. Getting the paint into the handle is simple. 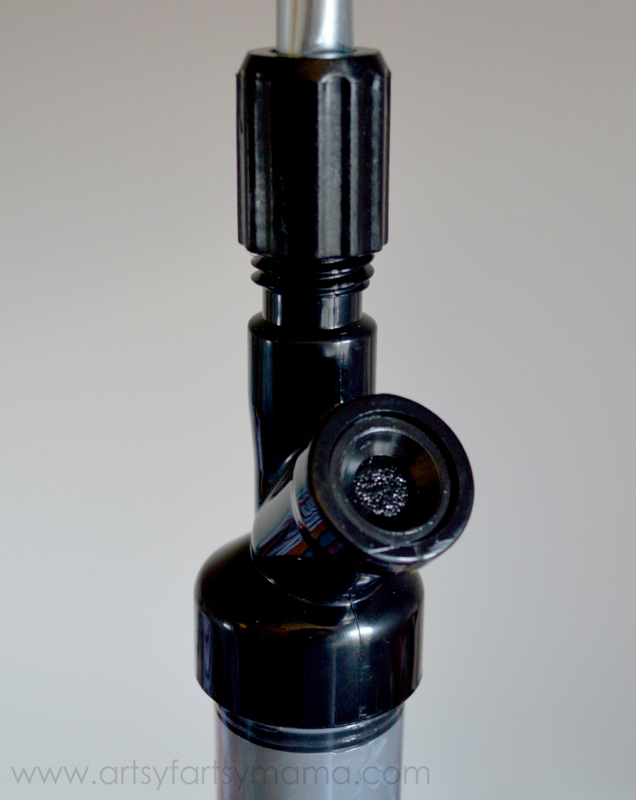 In the handle itself, the black section pictured is the fill port. It contains a spongy port that is placed over the fill tube on the paint can at a 45º angle. Gently pull the end of the handle and watch the paint pour in! No mess, and very minimal effort on your part. The paint roller is also unique with how the perforated roller cover allows paint to flow through the roller cover to add the paint onto the wall or surface being painted or stained. (This roller won't work with non-perforated rollers.) There's also a snap-on splatter shield to fit around the roller to help prevent any paint drips or splatters while you work. To get the paint to start flowing, slowly twist the end of the handle to push the paint up through the roller. The paint will start to show through the roller and you can start rolling paint onto the walls. When the handle runs out of paint, simply refill and keep going. The PaintStick EZ-Twist is also a wonderful roller to use on ceilings. Since you don't have to stop to mess with a tray, so you're saving lots of time and pain in your back! Our first coat of paint took around 30 minutes, which included a bit of learning as we went. Put the excess paint back into the can by placing the handle onto the fill tube and twisting the handle. The paint will empty back into the can easily without a mess. We left it to dry for a couple of hours, and came back to add another coat. By the end of the evening, the bathroom was painted! All that was left was the corners and edges. Painting edges/cutting in a room are probably the most frustrating part of painting for me. I end up messing up part of the wall, or don't get it looking as clean as I'd like. With the HomeRight® QuickPainter Pad Edge Painter, you can draw paint directly from the paint can, so there’s still no messy tray or brushes to use. I was able to quickly and cleanly paint edges around the shower tile, near the baseboards, window trim and door. You control the release of paint onto the applicator with the handy on-handle trigger. The three-inch pad is made of a high-quality neoprene material which means a clean, smooth finish with no messy brush or roller marks. In just one evening we were able to easily paint our entire bathroom. My daughter even helped a little, which was fun for her (and easy for me to fix when she was done) and I was impressed by how simple and effective the roller and edger were to use. Now that our master bathroom is complete, I am excited to get to share it with all of you! I hope my experience can help some of you on your next painting project. 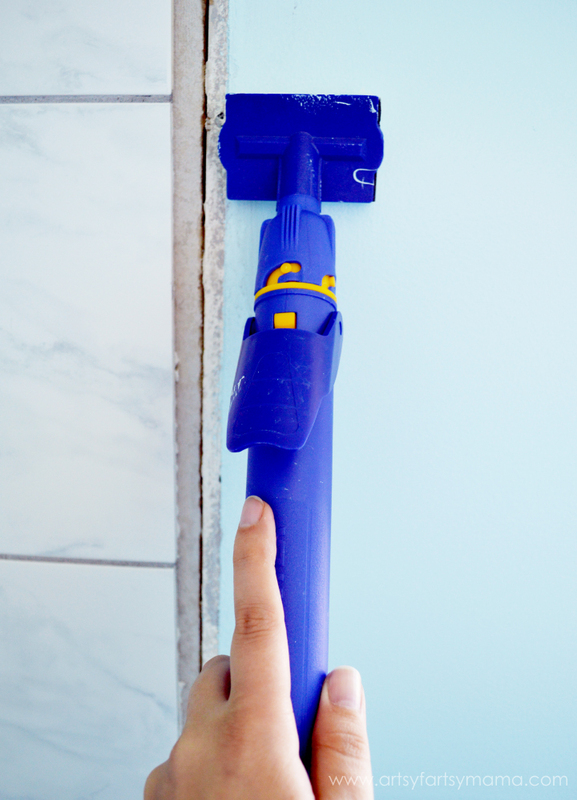 What cool product to have that makes painting a bathroom much easier! Oh I absolutely LOVE this color! It looks great in your space! 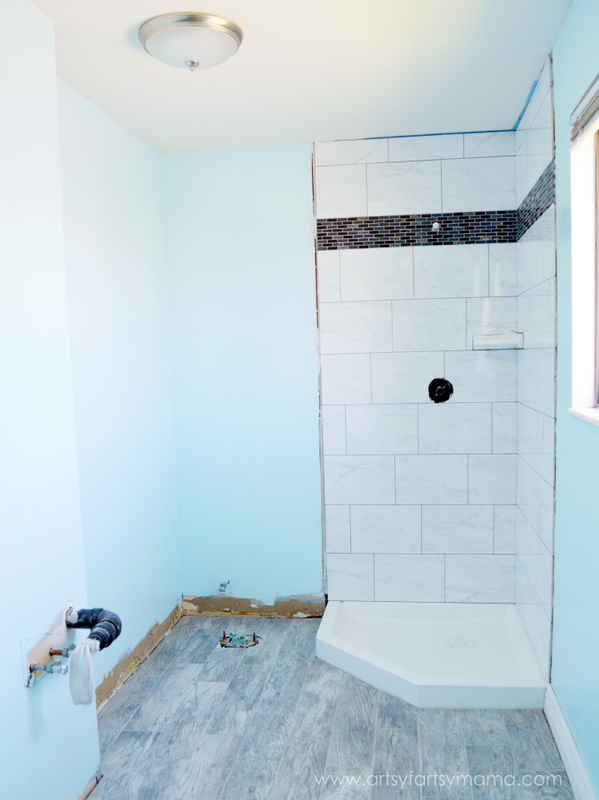 I wish I had known all these tips when my hubby and I were renovating our master bath! This is so cool! I would totally use this to paint our living room! WOW what a awesome tool. We are remodeling my grandma's house and this would really come in handy! Honestly? My bathroom! Haha, I've painted most of the other rooms, but my bathroom is like big bird yellow. The previous owners are nuts. What an awesome product! We just painted our guest bath, and wish I had known about this! This eliminates the part of painting I dislike - heading back to the pan! Great idea! I would paint my out-dated kitchen. All great tips and the bathroom looks amazing!! Well done friend! This is an awesome painting tool - love all the features!!! 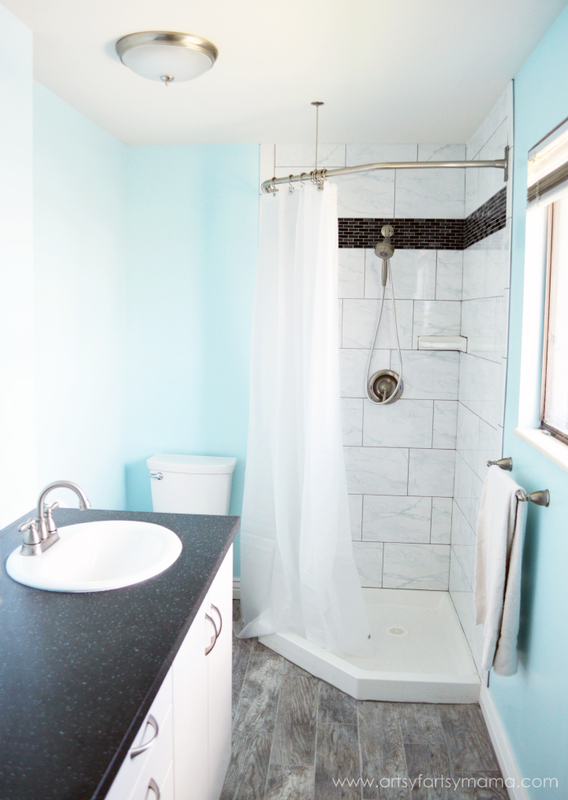 Your bathroom looks amazing - love the paint color your chose! I would paint our bedroom. Or, in other words, finish what my husband started. I would paint our bathroom for sure! I would paint my spare bedroom.